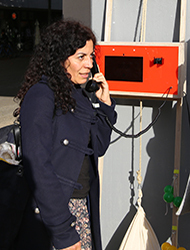 In order to inform and concretize a participation process around a public issue in the Mehringplatz neighborhood in Berlin, we conceptualized and implemented a digital-analoge audio box. The topic is the longterm construction site in the Mehringplatz neighborhood. Through the box complaints, questions and ideas could be recorded. All inputs were collected and presented in a public projection and can be looked at on this website. The installation was realized within the bilateral Project »Community Now?«, funded by the German-Israeli Future Forum Foundation (DIZF).